A 13-year-old Pakistani girl is to become the first female to swim for her country in the forthcoming Olympic Games in Athens. 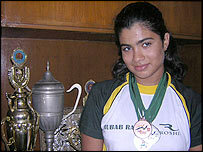 Rubab Raza, from Lahore, goes to school but has still found time to compete in many international swimming matches. She has won two silver medals and one bronze in the ninth South Asian games held in Islamabad this year. The dynamic teenager has taken part in championships in India and Spain and hopes to win gold at senior level. Rubab has won a wild card entry for the 2004 Olympics due to her performances in swimming championships around the world. "I am very happy about my achievement and consider it a great honour," she said. Rubab is now training in Lahore under the supervision of her parents, who are also bearing all her expenses including a special diet and private coach's fee. She gets a scholarship of around $30 per month from the Pakistani Swimming Federation, but says her expenses are far above this. "I have three hours of training in the morning and three in the afternoon, with the remainder of the time doing weight exercises. "Sadly the facilities are not the same standard as in the West, but I have to make the most of what I have got. "Ideally to train for the Olympics I should have a foreign coach but neither I nor the Swimming Federation can afford that." Rubab's mother has already taken time off work to help her daughter cope with the demanding schedule. Both want to ensure that Rubab's passion for the pool does not come in way of her studies. "There are many talented women swimmers in Pakistan," says Rubab, "but they do not excel due to lack of proper coaching and other facilities." Another problem for the aspiring young swimmer is the threat posed by some hard line Islamist elements, who have made known their opposition to girls and young women taking part in the sport. World Cup: Why can't South Asia make the grade?